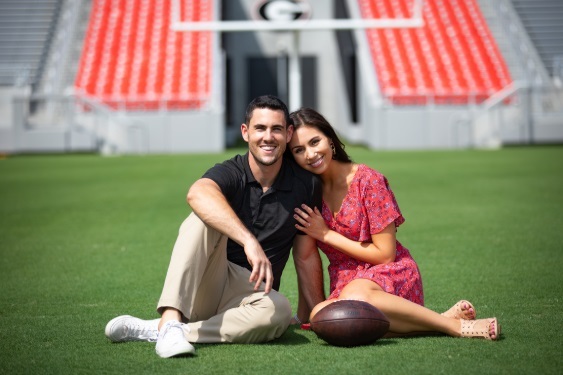 A few years ago, Aaron Murray spent his Saturdays in Athens playing Between the Hedges for the University of Georgia Bulldogs. 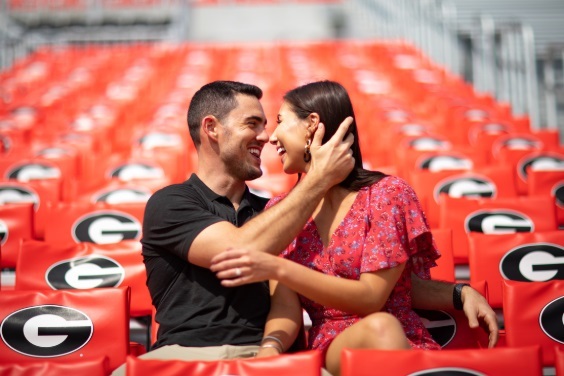 Now, the former UGA quarterback has stepped onto Sanford Stadium for a different occasion: his engagement photos. This past July, Aaron got engaged to his now fiance Sharon Stufken. We spent the morning with the future Mr. and Mrs. and photographer Blane Marable to hear all about the couple’s upcoming wedding plans as they took their engagement photos in Athens, Georgia. The couples’ love story began in January 2016. After previously noticing Sharon at a dog park, Aaron spotted her again four months later when his dog, Georgia, ran up to Sharon’s dog Harper. Their dogs began playing together and Aaron took advantage of the moment to ask Sharon out on a date. For their first date, the two met for dinner and drinks in Atlanta. Unaware of Aaron’s previous football history at the time, Sharon recalls the Uber driver asking for a picture with Aaron. The couple connected instantly and ended up going on a date every night that weekend. They have been dating ever since. 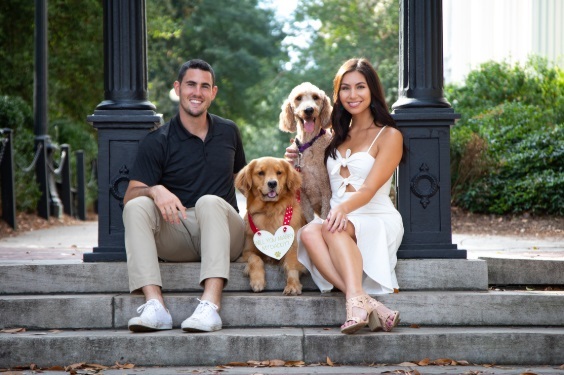 While many former UGA football players incorporate the Dawgs into their proposals, Aaron popped the question with the help of some other dogs: Harper and Georgia. Early one Friday morning in July 2018, Sharon and Aaron made their way to Fetch, a dog park and bar owned by their friend, for what she believed was a photo shoot to promote the venue. Upon their arrival, Aaron took the dogs to find tennis balls, but they returned with something else. 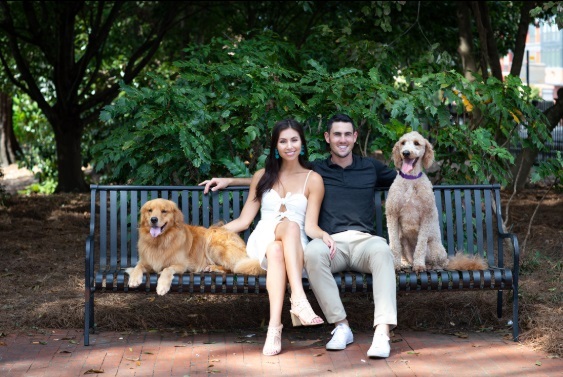 The two dogs ran towards Sharon with a sign tied around Georgia’s neck that read “Will you marry my daddy?” “I wasn’t expecting it at all,” Sharon said about the proposal. 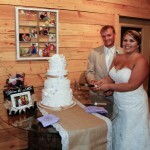 When it came time to begin wedding planning, one thing was for certain: the wedding would be in Athens. Sharon’s father was a professor at UGA, so she spent some time living in the Classic City. 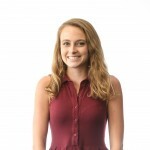 Like Aaron, she is also a graduate of the University of Georgia. Certain they wanted to include UGA’s campus into their wedding, they selected the UGA Chapel on North Campus as the venue for their wedding ceremony. The two will tie the knot next summer on June 1, 2019. The UGA Chapel is not the only well-known Athens location that will be incorporated into their big day. 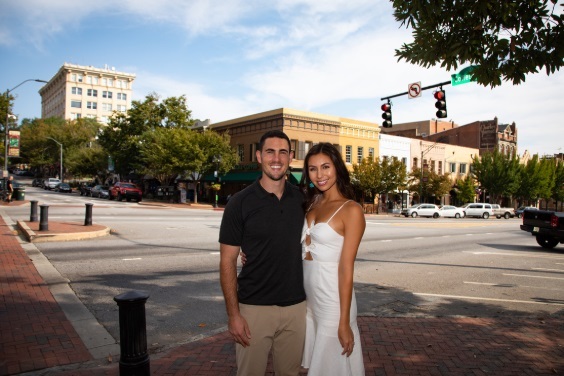 After the ceremony, the wedding festivities will move off campus and into Downtown Athens. Their reception will be held just minutes away from UGA in The Atrium at The Classic Center. Aaron Murray began his collegiate football career with the Georgia Bulldogs during the 2009 season. In 2010, he became the starting quarterback for the Bulldogs, a position he held through the Bulldogs’ 2013 season. Aaron currently works as an analyst for CBS Sports Network. To see the highlight reel from their Athens, GA engagement photo session, check out this video. To see more pictures from their photo shoot, flip through this album by Blane Marable Photography.